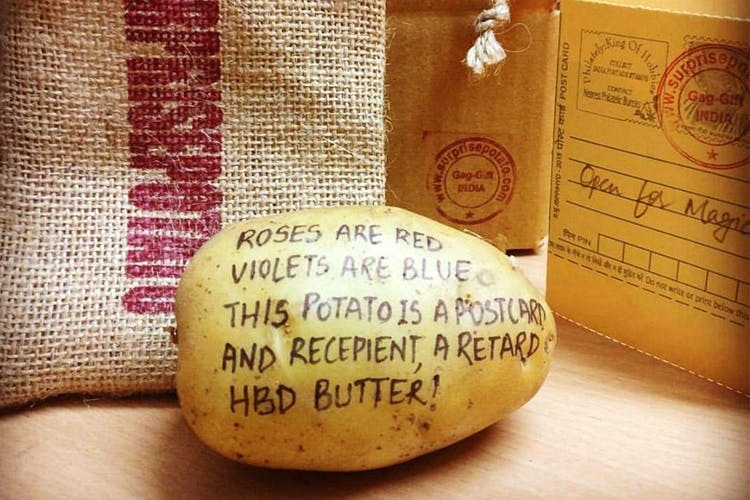 Dig deep, and send your pal a super thoughtful gift — a potato from Surprise Potato! Cards, flowers, jewellery, poetry? Boring! It’s time to up your gifting game. What says love better than a potato in this millennial age? A potato with a personal message on it. Surprise Potato will write your message on a big potato, package it in a jute drawstring bag and deliver it to your loved one. Think framed pictures are so yesterday? Fret not, they’ll even put a picture you give them on a potato and ship it off. It’s a fun prank to play on a friend and also a great way to keep the humour alive in any relationship. Although we suggest you don’t send one with a tear-jerking emotional message to your mum, lest she gets annoyed and puts it in tomorrow’s aloo ki sabzi.